Whenever people ask us what is the best New Pulp Fiction being published today, we’ll invariably point them to the Agent Pendergast novels by Douglas Preston and Lincoln Child. In the same way Clive Cussler’s Dirk Pitt is a modern interpretation of the classic pulp hero, Doc Savage, FBI Special Agent Aloysius Pendergast is our Shadow. We first became aware of this series when years ago a dear friend sent us copies of “Still Life With Crows” and “The Cabinet of Curiosities,” two of the early entries, as a Christmas gift. Thus leaving us with a debt we’ll never be able to completely repay. That we instantly were enamored with Pendergast and his world would be a gross understatement. Preston and Child, in the grand tradition of the classic pulps, pull out all the stops and their plots are incredibly far-fetched, over-the-top, crazy mysteries filled with the most bizarre villains, monsters and incredibly brave heroes. Okay, if the above paragraph hasn’t won you over, there’s no need to continue reading this review. 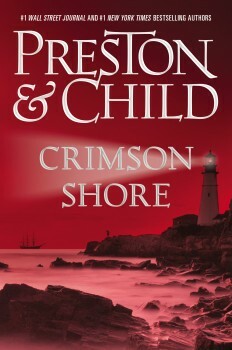 “Crimson Shore” is the 15th book in the series. It begins when Pendergast and his beautiful young ward, Constance Greene, travel to a small fishing hamlet on the coast of Massachusetts named Exmouth. They have been hired by a well known sculptor, who resides in the village. His priceless wine collection has been stolen from the cellar of his lighthouse cottage. During their investigation, they uncover a centuries old murder which sets them on a hunt for a mysterious killer who lives in the marshes along the shore. Soon both Pendergast and Constance are delving into Exmouth’s sordid past; a history connected with the infamous Salem Witch Trials. When several people are slain and their corpses found tattooed with arcane symbols, panic begins to grip the small, close knit community and our heroes are quickly caught up in a suspenseful chase that will lead them into shadowy horrors beyond anything they have ever faced before. 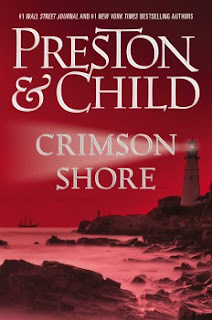 “Crimson Shore” is a roller-coast page-turner that will keep even the most jaded reader up till the wee hours of the night. Its final mystery is one we never saw coming and one we will never forget. Kudos to Preston and Child for this masterful series that shows no signs of plot fatigue yet. And in this day and age, that’s saying quite a lot. 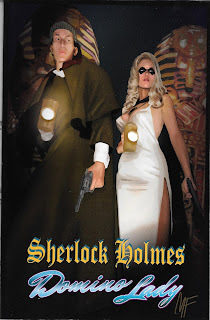 This is the final entry in the Fight Card Sherlock Holmes trilogy as written by Canadian pulpster, Andrew Salmon. No stranger to Holmes and Watson, Salmon’s stories of the Great Detective have earned him awards and well deserved recognition. 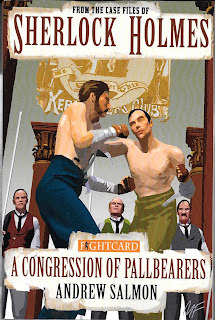 Thus it was not a fluke when Fight Card publisher, Paul Bishop, first approached him a few years ago to bring the Baker Street Detective into the world of boxing. Salmons first two books, “Work Capitol” and “Blood to the Bone,” were well received by Holmes fans around the world. So meticulous is Salmon’s research and his ability to turn a Victorian phrase, his stories flow with a perfect Arthur Conan Doyle pitch that is so familiar to readers. And now we have the third and final chapter of this stellar trilogy. “A Congression of Pallbearers,” picks up a few years after the events in the second adventure. It begins with an assassination attempt on Holmes and then the plot meanders into a convoluted espionage affair which reintroduces the alluring character of female pugilist Eby Stokes. Upon the culmination of their first encounter in the previous book, Miss Stokes had been recruited by Holmes’ brother, Mycroft, to be an operative for Britain’s Special Branch. What with the world racing towards a new century filled with all manner of scientific marvels, the Empire’s role seems to be diminishing and she appears more vulnerable than ever. Soon after the attempt on Holmes’ life, a female agent is brutally murdered and Holmes begins to suspect both incidents are connected. He and Watson confront Mycroft only to learn Stokes, and her partner, a male agent named Andrew Martin, have gone missing while on assignment in Berlin. Days later, Miss Stokes suddenly appears at Holmes’ door with a dangerous tale of her own. She and Martin, while in Germany, discovered that Special Branch had been infiltrated by foreign agents who were systematically obtaining sensitive British secrets and smuggling them out of the country. Not knowing who they could trust, the pair returned to England via a clandestine route and were now hiding in fear of their lives. As is typical of all Salmon fiction, the plot bolts forth like a rocket propelling the narrative along at breakneck speed, all the way delving into the personalities of the players with a deft, often heart-warming perspective. His ability to bring Holmes and Watson to life while at the same time lavishing us with local color, history and action galore is at its zenith in this offering. 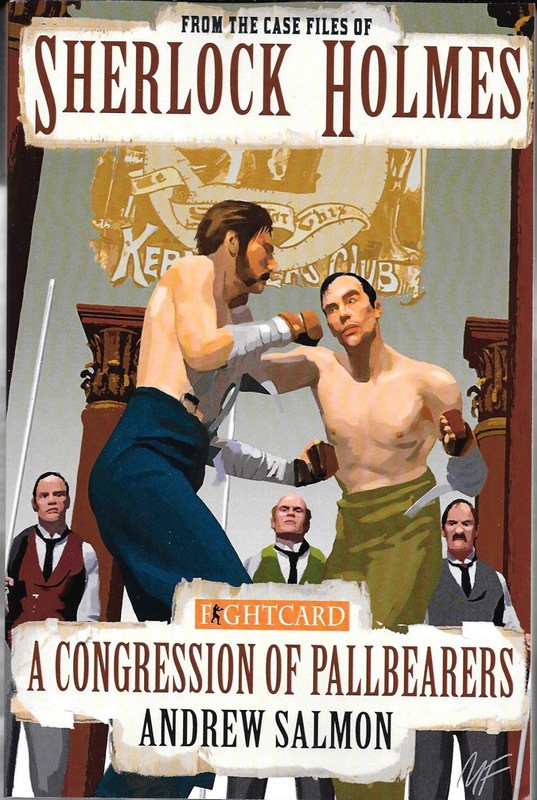 In the end, he has saved the best for last, “Fight Card – Sherlock Holmes – A Congression of Pallbearers,” is an amazing work by a master storyteller. Not to be missed. Of course it’s always awkward reading any series backwards, but the simple truth is we so loved these characters we simply dove into the tale and kept our fingers crossed it wouldn’t be too difficult to understand what was what. 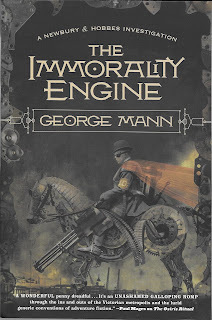 Mann is a steampunk writer and the world his characters inhabit is filled with airships and steam-powered Hansom cabs that weave their way through the streets of Victorian London dodging the more traditional horse-driven models. Both Sir Morris Newbury and Miss Veronica Hobbes are special agents of Queen Victoria; an aged monarch now living via the workings of a clockwork mechanism. The case begins when the duo is recruited by Scotland Yard Inspector Charles Bainbridge to investigate two murders of the same man. It seems the morgue has two corpses belonging to a burglar named Edwin Skyes but Sykes had no siblings; these are not twins nor merely look-alike individuals. Newbury quickly comes to the inescapable conclusion that one body is in fact a replica of the other. In other words someone has developed the process of human cloning. At the same time, Veronica is concerned for her sister Amelia’s well-being. Amelia is residing in a sanitarium because of her epileptic-like seizures which, when they occur, allow her to see the future. She is under the private care of the Queen’s own personal physician, Dr. Fabian. All should be fine and yet Veronica has her suspicions as to why Her Majesty is interested in her sister’s well being. Could the Queen be manipulating Fabian to discover the source of Amelia’s prophetic abilities for her own gains? Thus both investigators find themselves dealing with two totally different cases. Or so they believe until they come in contact with a secret society whose antiquated beliefs in spiritual rebirth may threaten the entire government. From this point on there are attempted murders at every twist and turn to include attacks by incredible mechanical monsters; all to stop Newbury and Hobbes from finding the truth. Once again Mann delivers a fantastic page turner that kept this reader thrilled and delighted from the opening scene to the last. “The Immorality Engine,” is everything one would accept from a colorful, imaginative steampunk adventure. Meanwhile, we definitely need to pick up books one and two.